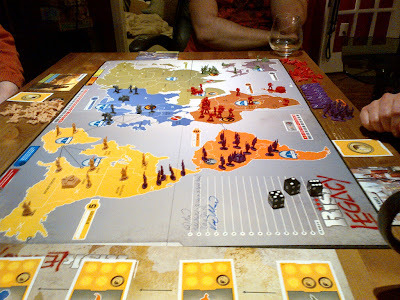 So my current favourite game has got to be Risk: Legacy. Take a simple classic game system which suffers from some epic flaws and add a brilliant story arc, real emotional investment, and the options for players to choose how these flaws get fixed over a campaign of games. It's brilliant and I can't seem to get the campaign we're playing out of my head. This is the best Ameri-trash game to come out in years and a must-own for anyone who can handle all the aggression. It is also a wholly new gaming experience that rivals the original excitement that Dominion brought a few years ago. Having said this, despite the ongoing emergence of new rules in our campaign of games, there is still a wild amount of dice rolling. The good thing is games don't usually last past 90 minutes so if you're losing the pain is over pretty quick. And it turns out I'm not the best sport either. Two games ago I threw a soldier piece at a dear friend of mine as she kept rolling 6's against all my attacks. Last night I nearly ended my almost 5-year relationship when I called my partner a "disengenuous, manipulative pig". I am loving this game too. We have played two games and have had a blast. We have had people whining about being beat up, and I was just as frustrated with someone when they kept rolling high. Let the insanity continue. If you could say "disengenous", you obviously weren't drinking enough! We're at game 7 now, and I haven't won once. Yep it's still Risk, but getting more and more insane as we play it. You have many surprises waiting for you. I got 8 games in so far, and almost all the packs are open. Still a brilliant game, even without the surprises.